Poetry Analysis. 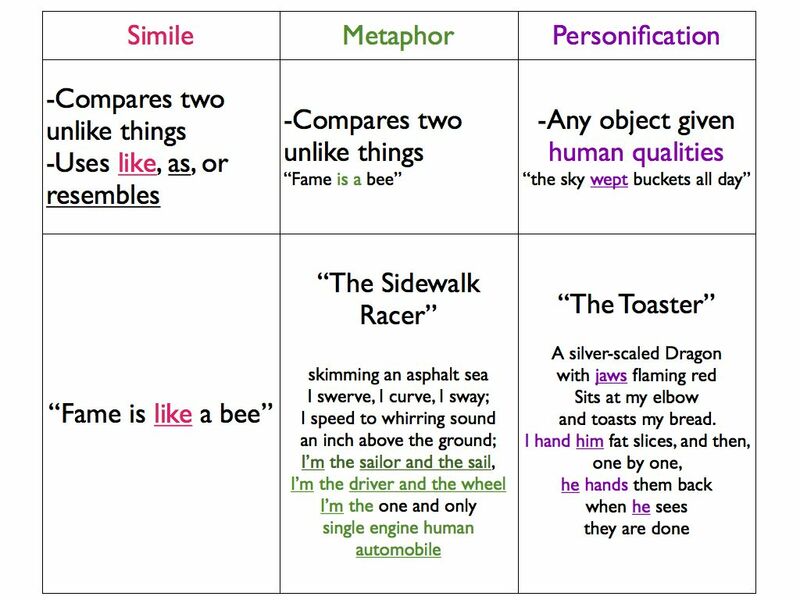 metaphor, simile, metonymy, personification. The tenor of "stuff of her life" is the emotional, intellectual, and physical experience of the daughter. This is compared to the vehicle "heavy cargo" which connotes a heavy burden that needs to be unloaded at the nearest port. The port for the daughter writing the story is the blank page in front of her; she needs to write about the experiences of her life in order to understand them. The "it" refers the comparison between the tenor—the daughter's ability to find inspiration to write another passage—and the vehicle—the bird's ability to find the open window. If the daughter does not write, then she will die emotionally and professionally; if the bird does not fly out, then it will die imprisoned in the room. The tenor of the bird lifting off the chair back and passing over the "window sill" is compared to the vehicle of the daughter finding the right passage and overcoming her writer's block. Thus, both the bird and the daughter enter into the world they have been struggling to enter into. The mutual elation of the bird and daughter are strongly felt. The tenor of another metaphor is the daughter experiencing writer's block, where the vehicle is the "trapped starling." As the bird hopes to find the right window and return to its home in nature, the daughter hopes to find the right words to express the "heavy cargo" of her life experiences on paper. The poet compares the sound of typewriter keys to a chain hauled over a gunwale on a ship. This develops the metaphor between the house and a ship even further. The lifting of the anchor by the chain allows the ship to move forward freely as overcoming writer's block allows the daughter to move forward in her writing. The tenor "starling" is compared to the vehicle "glove" which drops to the hard floor. The image of the dropping glove enhances our perceptions of the battered starling dropping to the ground after hitting the window. The solid thump is more easily heard through the simile and the feelings of defeat are felt. "Brilliance" is a detail of a window that is substituted for the window itself. It forces the reader to recognize the reflective sun on the window's glass, making the outside all the more alluring. The house is personified as quiet, reflective, and pensive. This allows the reader to imagine that because the father and daughter are so lost in thought it seems as though the house is lost in thought as well.